Developer Quote: "Eat your way around the world in our biggest virtual food app yet!" It's the weekend, and thoughts come to mind of taking some time to have a leisurely meal or two out on the town. How would you enjoy a menu of foods from around the world, similar to that offered at Epcot? More Buffet! is fun-filled with taste-tempting pleasure as you prepare tacos or nachos, roll sushi, create a pasta magnifico, whip up palate pleasing burgers and more. If that is not enough, load up your plate with over 150 different kinds of foods from 9 countries. - Build your own tacos & nachos, with choice of chips, taco shells, tortillas, or tostadas, and two dozen toppings from fajitas to guacamole and salsa. 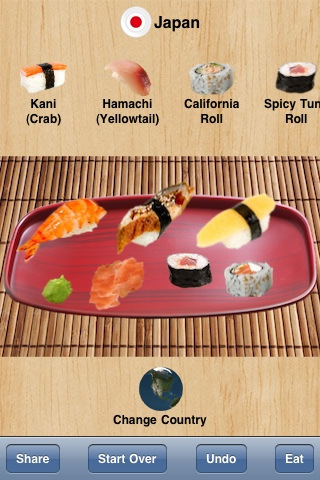 - Roll your own sushi. Choose from eight classic rolls like California, Spicy Tuna, or Dragon, add the ingredients, then roll and slice! - Create your own pasta. Pick the pasta (spaghetti, macaroni, ravioli, penne, and more) then add any of 7 sauces and 10 toppings. - Build a custom burger or hot dog. Hamburgers, veggie burgers, turkey burgers, hot dogs, and bratwurst, and dozens of options for buns & toppings. - Support for Game Center achievements and a top buffet maker leaderboard. - 20 plates and 14 tablecloths to give your food the perfect presentation. There's even more excitement to be had with More Buffet! though! Earn achievements when you build different plates of food thus unlocking intriguing secrets. Track your friends' achievements in Game Center to see what sort of culinary talents your friends possess. COOL CONCLUSION: "Sample global fun foods cuisine and create a yummy meal with More Buffet!" --iOS/Age Rating: This app requires iOS 3.1.2 or later. Rated 4+.